The EGX games show, held a couple of weekends ago at the NEC in Birmingham, saw some of the biggest names in gaming showing off their latest titles. British games were well represented, with Frontier Developments’ Elite: Dangerous among the biggest titles on display. Many other British studios were demoing their creations throughout the big budget, small publisher, and indie areas. So how large are the firms driving this thriving industry? 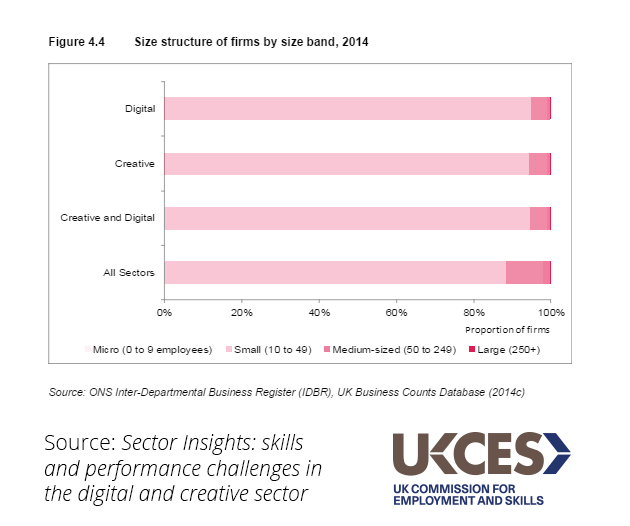 This chart, from our report on skills in the digital and creative industries, shows the extent to which the UK’s digital and creative industries are built on very small firms – over 80 per cent of the sector as a whole comprises “micro” firms: those with 0 to 9 employees. This suggests complex networks make up the industries – but also suggests there may be problems ahead with keeping up to date with training and skills. Our employer surveys show that whether a business carries out formal training is strongly correlated with its size – putting an exclamation mark over the digital and creative industries’ future proofing. This chart is taken from our sector insights report on the digital and creative industries. Let us know your thoughts on Twitter - we're @UKCES - or by leaving a comment below.